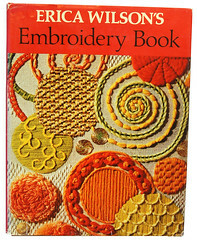 After writing about Erica Wilson's Embroidery Book the other day, I finally marched myself over to ebay and bought a copy. I rarely buy craft books. I guess I'm too cheap and we don't have the space for many more books. With a book like The New Crewel, I would rather be inspired by it and then walk away and do my own thing. If I have reference book with information about the various types of stitches in crewel and embroidery work (like EW's book), I can make my own patterns and projects based on the stitches and instructions provided in the book. Nevertheless, I still have some favorite project/pattern books: I've made many of the patterns in Last-Minute Knitted Gifts, and I'm looking forward to Joelle's upcoming patchwork/quilting book. But otherwise I'm not likely to purchase a craft book unless it's either a fantastic reference book or I like nearly every pattern in the book. I guess I'd rather own other types of inspirational books than a lot of crafting books. I'd be curious to hear what other people's favorite craft books are. Care to share? Anyway, it's Work in Progress Friday, so here are a few shots of my WIP. Another dress for Bebe, which I drafted and cut out several months ago and am finally sewing. Can't wait to show you the results! 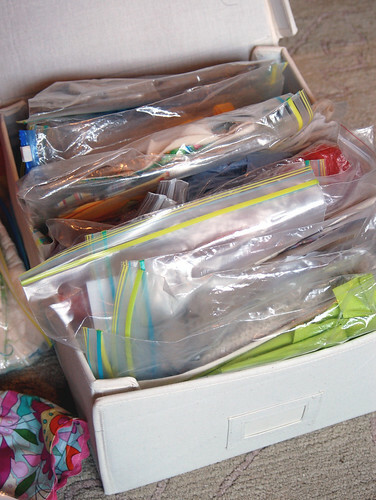 And the other photo is the WIP box: a canvas storage box from The Container Store that houses all my smaller projects, each in its own ziplock bag. It's been a good system for me, but the box is ridiculously full right now. And there are many other projects on the shelves in the bedroom; they just don't fit into the box. In other news, we found this rock sitting under a bench in our "back yard" (the playground outside our apartment). Initially I thought it was a neglected potato, sitting there all by itself. No matter; once we realized it was a rock, into the toy stroller it went, as does anything of interest these days, and it came along on our walk. That's one of the most amusing aspects of having a toddler: if something catches her attention it goes immediately into her stroller so she can look at it as she pushes it ahead of herself. Earlier this afternoon she was pushing a small wooden sailboat around the living room. I can't say I've ever seen a boat treated with such affection before. My favorite craft book is Elizabeth Zimmerman's Knitting Workbook! So much great information. Also- our little girl has adopted a yoghurt tub that she drives around on the floor like a little car! So funny what they attach themselves to. Oh my gosh she is SOOOO cute! Rock in a stroller and boat in a stroller! I think my biological clock just went off thats so cute!!! Love the new projects. 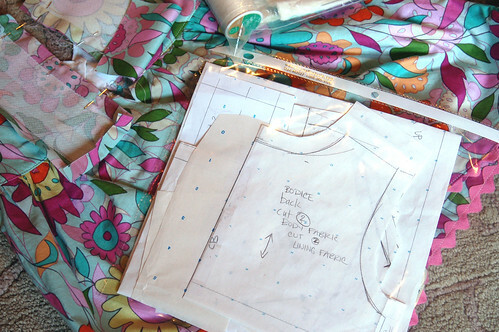 I am a wips in zips in a plastic box kinda girl too. Yay for organization!! The Floris Books of crafts to do with and for children are truly wonderful: Crafts Through the Year (Berger) and Toymaking with Children (Jaffke) are special favorites. and rock/boat in stroller?? that is just too darling! your observations of toddlers is soooo true - i can (and do) spend hour upon hour just watching our girls in amazement. 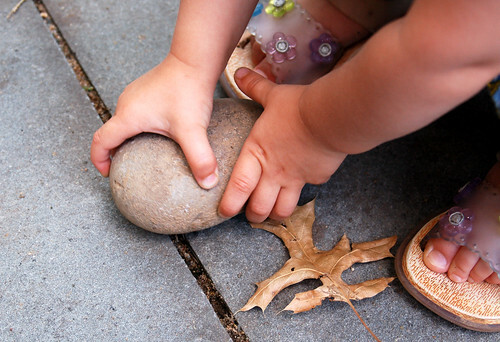 delighting in the wonder they find in simple objects and experiences most of us would overlook. i wish you continued enjoyment with your little one! and the WIP box is brilliant! alas, mine would be boxessssssss. I don't buy craft books either..don't think you are cheap like you say. We maybe see repetitive projects over and over and I just buy something if it's really cool. But I like magazines though. Love photographs and mags that inspire me. I keep all my thread in zips too. Love them! I had been enjoying "One Skein" knitting book for awhile now but just last week I bought a new knitting book that I'm sooo in love with that I took numerous photos and put them on my blog. It's called "The Yarn Girls Guide to Kid Knits". I'm currently making the roll edge v-neck sweater as a Christmas gift for my nephew but I changed it up with colors, it was sooo easy to adjust, that's what I love about the book.